Age-related Macular Degeneration (AMD) is an eye disease. AMD affects the macula, a part of the retina. The retina sends light from the eye to the brain, and the macula allows the person to see the fine detail of the image. What AMD does is it blurs the sharp central vision needed for straight-ahead activities such as reading, sewing, and driving. There are two forms of age-related macular degeneration: dry macular degeneration and wet macular degeneration. AMD is painless and the progression of AMD is slow that people notice little change in their vision. In others, the disease progresses faster and may lead to a loss of vision in both eyes. AMD is a common eye condition among people age 50 and older. It is a leading cause of vision loss in older adults. Scientists at Trinity College Dublin have discovered that a part of the immune system called the inflammasome is involved in regulating the development of one of the most common forms of blindness, called Age-Related Macular Degeneration (AMD). They have discovered that controlling an inflammatory component IL-18, in cases of Age-Related Macular Degeneration (AMD) could prevent the development of the disease. 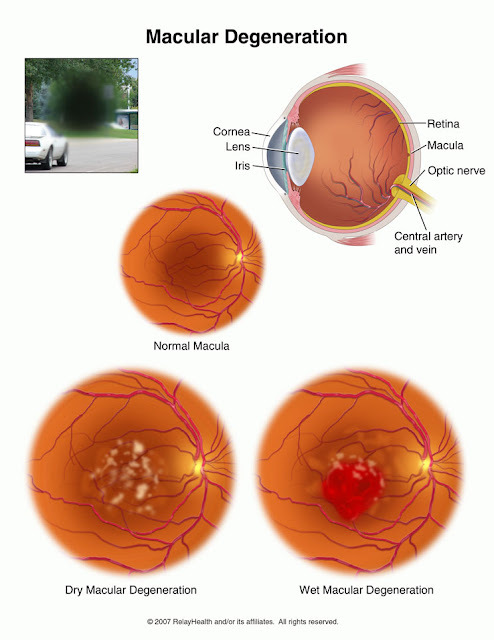 The disease AMD involves loss of central vision, people with advanced disease being unable to read, watch TV, enjoy the cinema, drive, or use a computer − in short, everyday living becomes very difficult. The research, which is published this week in the international medical journal, Nature Medicine, is supported by Science Foundation Ireland, the American Health Assistance Foundation (AHAF), the Health Research Board (HRB) and Fighting Blindness Ireland. Video: What is Age-Related Macular Degeneration? The key diagnostic feature of AMD is the presence of "drusen", which are recognised during an eye exam as yellowish/white deposits in the central region of the retina called the macula. Dry AMD is characterised by the presence of excessive amounts of drusen and there are currently no forms of therapy other than recommended lifestyle changes such as giving up smoking, which is a recognised risk factor. However, a significant number of cases of the "dry" form of AMD can progress to the "wet" form, where blood vessels underneath the retina begin to grow, leading to central blindness. If you hold two coins immediately in front of your eyes, you will see a single large black circle blocking out your central vision. This is a very realistic simulation of what it is like to live with advanced disease. The leading co-authors of the Nature Medicine paper, Trinity College scientists, Dr Sarah Doyle and Dr Matthew Campbell have together discovered that drusen accumulating in the macula can lead to the production of two inflammatory components termed IL-1beta and IL-18. These findings were based on studies involving drusen isolated from donor AMD eyes in tandem with pre-clinical studies on models of the disease. "Traditionally, inflammation in the retina or indeed the eye in general is not beneficial and is a pathological hallmark of many eye diseases, including AMD. However we have identified, that one inflammatory component termed IL-18 acts as a so-called anti-angiogenic factor, preventing the progression of wet AMD" says Dr. Campbell. "The progression from "dry" to "wet" AMD appears to be mediated by the inflammatory component IL-18, our results directly suggest that controlling or indeed augmenting the levels of IL-18 in the retinas of patients with dry AMD could prevent the development of the wet form of disease, which leads us to an exciting new prospect for a novel therapy for AMD" says Dr Doyle. The research was undertaken at Trinity College's Ocular Genetics Unit, Director, Professor Pete Humphries and at the laboratories of Professor Luke O'Neill at the Trinity Biomedical Sciences Institute, in collaboration with Professor Joe Holyfield at the Cole Eye Institute at Cleveland, Ohio.